Originally published in the Informanté newspaper on Thursday, 12 July, 2018. Two weeks ago, a team of researchers from 17 countries published a paper in Nature Geoscience, entitled “Palaeoclimate constraints on the impact of 2 °C anthropogenic warming and beyond.” Essentially, what these researchers did was study the changes in the paleontological record of the earth (fossils) before and during the last three times the planet experienced climate change due to temperature increases in the same range. The researchers looked at the Holocene Thermal Maximum (HTM) which occurred between 5 000 and 9 000 years ago, the Last Interglacial period (LIG), occurring about 129 000 and 116 000 years ago, and the mid-Pliocene warm period (MPWP), which occurred about 3.3 to 3 million years ago. The HTM and LIG events occurred due to changes in the earth’s orbit, but the MPWP had occurred due to atmospheric carbon dioxide concentrations of about 350 to 450 parts per million – or about the same as we have today. Of course, it took quite a bit longer for nature to reach those levels. By combining data from ice cores, fossil records, sediment layers, radiometric dating and other paleoclimate methods, they were able to paint a picture of what a warmer earth will look like once global warming has stabilized. In terms of polar ice sheets, they found a significant retreat of the Greenland and Antarctic ice sheets during those times, giving a global sea level 6 to 9 meters higher than currently. In terms of sea ice, it appears that a reduction of more than 50% was seen, which would indicate much warmer waters. These warmer temperatures caused changes to the marine plankton ecosystem, with a rearrangement of the surface-level habitat. Plankton started to migrate poleward, and experienced blooms in surface waters. On land there were large changes as well. 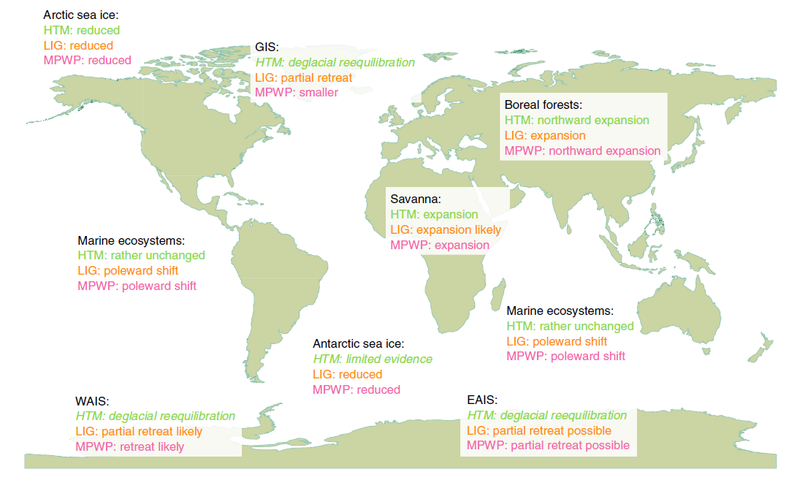 Most regions experienced a poleward shift of their biomes, as moisture regimes changed. The Sahara desert greened, and eventually vanished. The Great Plains of North America grew arid. The tundra and forest boundaries in the Americas and Asia shifted northward by about 200 kilometres. Even here in Africa, the Nama Karoo and fine-leaved savannah expanded. Across the globe, tropical climates and savannahs expanded as deserts shrunk. Just these changes could have profound effects for our current nations – farmland becoming unviable as other countries gain them, seafront property in danger – but the fossil record shows the real danger. While humans may be causing an increase in atmospheric carbon dioxide, nature will amplify it. A large amount of carbon is currently preserved in peat – partly decomposed plant matter. Large peatlands are maintain in forests and tropical climates as old plants died and form layers upon layers of them. This makes it the largest carbon sink on the planet. Peat, however, mostly forms where it’s wet – it’s a wetland phenomenon, after all – and with the increase in temperatures… Well, in the north, peat is usually protected by permafrost in the coldest climates. With widespread permafrost thaw, the peat will release more carbon than it absorbs, accelerating global warming. In tropical regions, climates will move, and savannahs will expand. Fine-leaved savannah that’s quite flammable, especially in warmer weather, and will release massive amounts of carbon into the atmosphere in continent-wide wildfires if it burns over former peatlands. These fires will devastate the edges of tropical forests, slowly turning the entire area into fire-maintained savannah and grassland ecosystems in the wake of natural deforestation. A rapid run-away change towards treeless landscapes will result. "Even with just 2°C of warming -- and potentially just 1.5°C -- significant impacts on the Earth system are profound," said co-author Prof Alan Mix of Oregon State University. "We can expect that sea-level rise could become unstoppable for millennia, impacting much of the world's population, infrastructure and economic activity." "Climate models appear to be trustworthy for small changes, such as for low emission scenarios over short periods, say over the next few decades out to 2100. But as the change gets larger or more persistent, either because of higher emissions, for example a business-as-usual-scenario, or because we are interested in the long term response of a low emission scenario, it appears they underestimate climate change," said co-author Prof Katrin Meissner, Director of the University of New South Wales Climate Change Research Centre. We here in Namibia have already experienced stranger and stranger weather patterns over the last decade. We’ve often heard of the so-called butterfly effect in weather forecasting – how a butterfly flapping its wings in Tokyo can cause a rainstorm in Johannesburg – and how it shows that long-term weather forecasting is a pipe dream. In more manageable terms, it explains how small changes in initials conditions can result in widely different outcomes in future. This paper shows another side to that – small changes now can have drastic effects on our planet in future. Yet it also gives us a bit of hope. Maybe, by making small changes now to our world, we can flap our wings, and change the outcome for our planet, and ourselves.